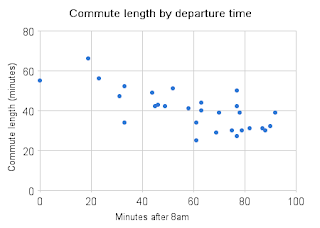 Roughly speaking, every minute later I leave saves me 24 seconds of commute time with dramatically diminishing returns after about 9:10am. I don't really have enough data from 8am to 8:30am but based on the traffic data I've looked at it doesn't suggest my data is atypical. The commute home, on the other hand, is much more consistently between 25 and 30 minutes (though I never leave before 6pm). But, I'm told the evening northbound commute is never as bad as the morning southbound, even at peak. I'm also told the morning commute isn't much better until you get to before 6:30am. This doesn't quite add up, since there presumably isn't a sustained migration into the city. Overall though, we're really enjoying living in Reading. That said, the 15 minute commute was nice. If you or anyone you know wants to buy a lovely single-family home in Somerville with an extremely short commute into Cambridge and Boston, our house is on the market and is having an open house this Sunday. See the realtor's site for it at 94Jaques.com for details.